Although, it sounds like a Bruce Lee fight move, Kaizen is a very positive and common-sense Japanese philosophy for change. 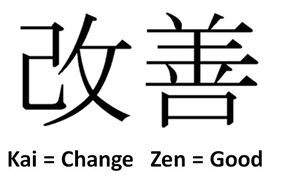 Kai means change and Zen is the universally recognized word for good; together Kaizen simply means good change. How do you make change good? How do you make changes the Kaizen way? And why do you even have to change in the first place? Let’s start with the last question first. Change is inevitable. Change is reality. Change is life. If you fail to change, you fail to survive. Think of companies like Blockbusters and MySpace or products like Kodak film and the walkman that have just become obsolete as things changed. Like it or not, things are going to change. Like it or not, you’re going to have to change and this is not just at an organizational level; like it or not, you yourself are going to have to change – learn new skills, use new technologies or interact with new people and markets. So now that we’ve established that we all have to change, how do you go on about making these changes? Should you just turn your world upside down and start a new way today? Well, not really! Actually, please don’t do that! Rapid and massive change overhauls cause resistance and are very difficult to sustain. Have you ever wanted to lose weight and started a crash diet that crashes in no time? If not, you’ve seen someone do it. And if yes, you’re not alone! That’s where Kaizen comes in. Kaizen is all about change through small steady steps. It is the age old wisdom: “The journey of a thousand miles begins with a single step”. To start living the Kaizen philosophy, think about all the areas of your life that need improvement. It might be your time management, your health or even your relationships, and rather than setting goals like New Year’s resolutions (We give up on them by Jan 2) set realistic mini-goals. Let’s say you want to exercise, instead of saying you will exercise for an hour a day (that’s a big jump from zero hours to one hour a day), start with 10 minute walks, stretches, or even taking the stairs. Once you make that change a habit, you improve on it. 10 minutes becomes 20 and 20 becomes an hour and you have lived up to your new year’s resolution. Kaizen is the belief that small changes over time can create huge life changes. Change your life today, the Kaizen way and you’ll thank us for it. 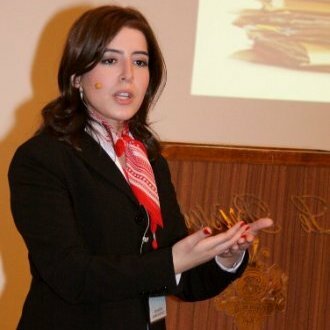 Her main focus is HR, Leadership, and Quality.